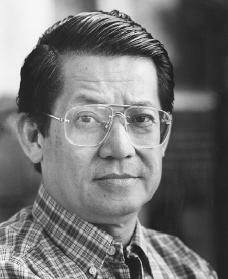 Benigno Aquino of the Philippines was a leading opponent of the rule of President Ferdinand Marcos (1917–1989), who governed the Philippines from 1966 to 1986. Aquino's opposition ended in August 1983 when, after living in the United States for three years, he returned to the Philippine capital of Manila and was assassinated (killed) at the airport. Aquino's death touched off massive demonstrations against President Marcos. Benigno "Ninoy" Aquino was born on November 27, 1932, in Tarlac Province, on the island of Luzon, to a prominent family. He was the grandson of a general and the son of a Philippine senator who was also a wealthy landowner. His ambition and energy stood out early when, at age seventeen, he was sent by the Manila Times newspaper to report on the Korean War (1950–53). The war was between the Democratic People's Republic of Korea (North Korea) and the Republic of Korea (South Korea), and was a war in which the United States and China eventually joined. At age twenty-two Aquino became the Philippines' youngest mayor in his home-town of Concepcion. Just six years later he became governor of Tarlac province (a position similar to governing a state). In 1967 Aquino once again made history when he became the youngest senator ever elected in the Philippines. Meanwhile he married Corazon Cojoangco, with whom he eventually raised five children. Philippines in 1983. Upon arriving at the Manila airport he was shot and killed. Following the assassination President Marcos was pressured to appoint a five-person, politically neutral investigative board, led by Judge Corazon Agrava. Marcos and the military stated that a lone gunman who had been hired by the Communist Party had carried out the assassination. The alleged gunman, who had been shot at the airport immediately following the shooting of Aquino, could not be cross-examined. The military carried out its own investigation, and reported that no military personnel were involved in the death. The official commission's majority report found that Aquino was not slain by the alleged gunman, as Marcos and the military claimed, but was the victim of a "criminal conspiracy" by the military led by General Fabian C. Ver, who was the armed forces chief of staff. He was also a close friend and cousin of President Marcos. The commission's findings were astonishing, although from the beginning most Filipinos doubted the official version of the assassination. No proof was ever presented that directly showed Marcos was involved, but almost no one in the Philippines believed that military generals would order the execution of Aquino on their own. Those who suspected Marcos's involvement noted that Aquino posed a threat as someone who might unite the opposition and who had been the president's main rival for decades. As it turned out the democratic opposition to Marcos was strongest after its leader's death. As Marcos lost the trust of his people, the Philippine economy also fell apart. By 1985 the nation was in political and economic chaos, with Marcos under attack by the press and by the strengthened political opposition, which did well in elections. In December 1985 the court proclaimed that General Ver and the others charged with Aquino's murder were not guilty. Marcos promptly returned Ver to his former position. Popular unrest with Marcos's rule grew steadily, however. Within weeks a political movement formed around Aquino's widow, Corazon. She was elected president of the Philippines in 1986, unseating Marcos. Hill, Gerald N. and Kathleen Thompson. Aquino Assassination: The Story and Analysis of the Assassination of Philippine Senator Benigno S. Aquino. Sonoma, CA: Hilltop Pub. Co., 1983. White, Mel. Aquino. Dallas: Word Pub., 1989. Instead of returning (from Boston) a cold corpse from a lingering disease that will surely kill Ninoy in 3 months time, both Ninoy and Cory decided to return home and planned his own assasination and eventually end up a hero. This is the truth! It is a true heroism of no proportion! It is very sad to think back that a good person like ninoy aquino died the way he did. most of the time greediness in almost everything can do a lot of damage to everyone. whoever mastermind his death hopefully is being haunted by the evil act they did. when i think about what ninoy's family went thru during his inprisonment it breaks my heart. his family were deprieved of the time and attention that his family deserve most especially his children. thank God he married a very religious and strong person that was able to handle everything. i think the reasons why she survived everything was because she was very close to God. let us all pray that their children can carry on whatever their parents started and fought for and pray that hopefully they will be guided in all that they do. It really helped me in my quiz! AT PRESENT THE PAST WILL BE REPEATED AGAIN BETWEEN GLORIA AND BINOY. DURING THE TIMES OF GLORIA WE ALWAYS BLAMED HER BECAUSE OF THE SMALL ANOMALIES BUT NOW WE SEE HER TIMES WAS FAR BETTER FROM AQUINOS ADMINISTRATION. FILIPINOS ARE TRULY IDOLATERS THATS WHY WE CANNOT MOVE AWAY FROM POVERTY. SEE WHAT AQUINO ARE DOING TODAY DO NOT BE BLIND. LETS OPEN OUR MIND. I WILL BE NO LONGER SURPRISED WHEN IN THE FUTURE A SERIES OF CUDETA WILL AGAIN HAPPENED. I was astounded to read lightbearers diagnosis of the assassination. Is there any truth whatsoever or any evidence whatsoever to make a statment like that. ABOUT THE LIFE OF NINOY AQUINO.